Nothing like freshly made corn tortillas! Sore bought are like cardboard...why not make your own? 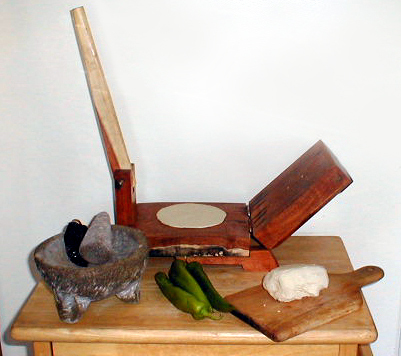 It's easy if you have a tortilla press which you can get at any Mexican market. Knead mixture to form a ball. Dough should not be too dry (i.e. if it 'cracks' when it is rolled into a ball, add more water). Once it is the right consistency, heat a flat pan on the stove. Form golf-ball sized balls of dough, and flatten in a tortilla press for best results. Cook on a hot flat pan and turn once it starts to puff up a little bit. For added showmanship, cook them on a non stick skillet and you can show off and flip them in the air.